Sub:- Implementation of Govt. 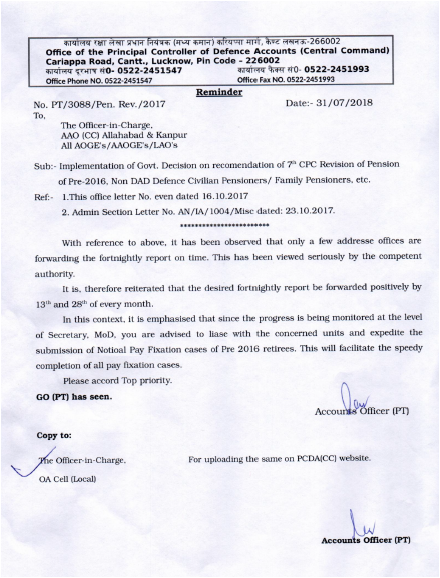 Decision on recommendation of 7th CPC Revision of Pension of Pre-2016, Non DAD Defence Civilian Pensioners/ Family Pensioners, etc. 2.Admin Section Letter No.AN/1A/1004/Misc dated: 23.10.2017. With reference to above, it has been observed that only a few address offices are forwarding the fortnightly report on time. This has been viewed seriously by the competent authority. It is, therefore reiterated that the desired fortnightly report be forwarded positively by 13th and 28th of every month. In this context, it is emphasised that since the progress is being monitored at the level of Secretary, MoD, you are advised to liase with the concerned units and expedite the submission of Notioal Pay Fixation cases of Pre 2016 retirees. This will facilitate the speedy completion of all pay fixation cases.